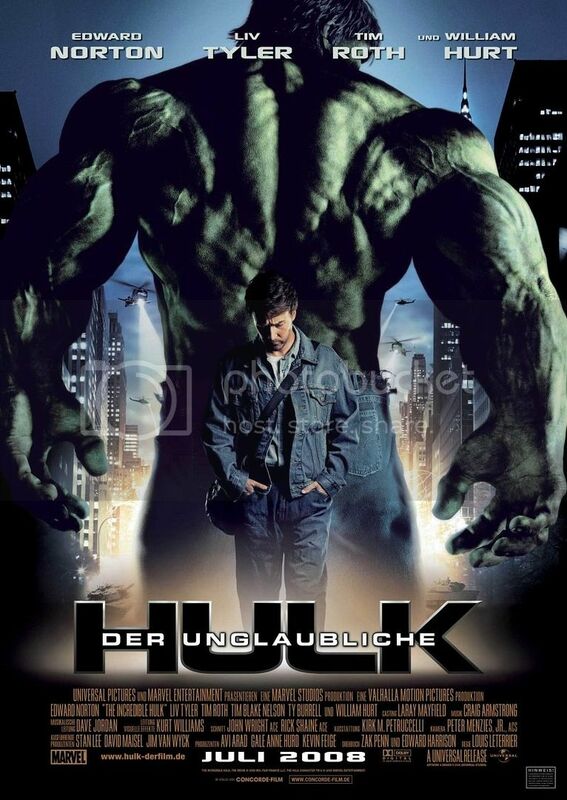 I've already mentioned how much I like the Ang Lee version of the Hulk, which was released in 2003. As part of my review of the Avengers line of movies, I also decided to view The Incredible Hulk, the 2008 reboot. To say that the two films are the antithesis of each other would almost be an understatement. The 2008 Hulk movie looks at every direction that the earlier movie went and decided to go in a completely different one. Other than the fact that they're both about a guy who turns into a big green monster and that they both have characters with the same names there really isn't much commonality. In some ways its interesting to have two movies with the same basic premise made so close together because it shows you the range of possibilities that a movie adaptation can afford you. On the good side, the Incredible Hulk undoes the biggest sings of its predecessor. It has really good pacing. Watching it with a critical eye you notice that there's one Hulk out per act of the movie and each one is about the relationship that Blonsky has with the Hulk and is a turning point in that relationship. While Ang Lee's film was a little experimental this one goes for a very traditional build up and a standard structure of a story. I have no complaints there. We also get a decent villain in Blonsky who eventually becomes the Abomination. Gone are the deranged antics of Nick Nolte and instead we get Tim Roth, who I'd argue is the real star of this movie. He makes every scene that he's in more interesting. There's an intensity to his performance and even though he's a relatively short man he sells the fact that he's a tough-as-nails soldier who feels like his body is betraying him but lives for the thrill of combat. Finally, we have no strange comic book panel convention for telling the story. The shots are far more conventional or when they are artistic its in the same ways that other movies have been. Some scenes remind you of the kind of slow motion action sequences that Zack Snyder is fond of and other bits give you a perspective from people who are witnessing the action and are not central to it ala Cloverfield. But really with all that aside, I don't really agree with much of this movie. Casting wise I think that Tim Roth was fantastic and Ed Norton is a fine Bruce Banner. But then you get to the really maddening things like who decided that Liv Tyler should be Betty Ross? In the commentary and extras we hear a lot about how Liv looks like Betty in the comics but there is absolutely no chemistry between her and Norton. I do not believe that these two are in a relationship. I'm sorry but Liv is cute but I don't think that she's all that great of an actress and she certainly can't stand in the same shoes as Jennifer Connelly. I literally could not believe it back in 2008 when I learned that William Hurt was going to be General "Thunderbolt" Ross. William Hurt?! I can buy him as Leto Atreides in Dune. I do not buy him for a moment as the hard boiled general. The thing that's truly maddening about this is that Sam Elliot was perfect for the role. Whatever problem people have with Hulk, it had perfect casting, Nolte aside, and I think that it's ridiculous that it was not utilized here. With just a few tweaks this could have been a sequel to Ang Lee's movie and still fixed the problems that movie had and utilized the same casting. Instead director Louis Leterrier seems obsessed with throwing the baby out with the bathwater just so that it can be 100% his vision even though he admits in the commentary that Connelly would have been great but he didn't want any association with the previous movie. I also feel like Tim Blake Nelson while fine for the role that they gave us would have never been right for The Leader if there had been a sequel. He was a little to goofy. I think that someone like Jeffrey Combs would have been perfect in that role and that's someone that I would be fine playing the Leader in any Hulk movie in the future if we ever get one. The other thing that bothers me about this movie is that all of the nuance of the Hulk is gone. This really is just I get big and green and dumb although even then it's just like I'm hyped up on drugs so I may be smart sometimes. None of the things that made the Hulk interesting are on display here other than the power. That may be interesting to some people but there's a reason why I'm not really interested in the Hulk prior to the Mr Fix-It days. The idea of a big green rage monster just isn't interesting to me. Part of the problem is that Leterrier is also obsessed with the original Hulk TV series which also lacked a lot of the nuance. I understand that that is the version of the Hulk that is more prevalent in pop culture and what most of the general public would know, but that show never really captured the essence of the Hulk and was more about the sadness of being David Banner. To me the idea that Bruce could hulk out because he's making love to Betty is absurd. It's not about his heart rate. It's about his anger and rage. In fact keeping Banner laid should be the number one way to keep him from Hulking out. They lost the whole idea that the Hulk is actually a great big psychological wound. His mind is fractured and he has no knowledge of anything that's going on while he's Hulked out. It's not like taking drugs so he only has dim memories. He has no memories because he's not the personality that it happens to. Because of that you also lose the Hulk's innocence. I watched this movie and never once does the Hulk seem sympathetic. It is just a monster that attacks in self defense I agree but the amount of dead bodies that this Hulk leaves in its wake is a little disturbing. The idea of the Hulk originally came from Stan Lee combining Jekyll and Hyde with Frankenstein's monster and we're sorely lacking the Frankenstein's monster portion in this movie. There may be the odd fatality in the wake of the comic book Hulk but its not because he murders people it's typically because of collateral damage in the wake of one of his Hulk outs. I just don't like this version of the Hulk. It feels like a completely empty and hollow take on what can be a really great and complex character. One thing of note. Most of the cut scenes involved more stuff between Betty and her boyfriend. It turns out that the boyfriend was Doc Samson. I agree that cutting out his scenes didn't take anything out of the movie but I thought that'd be an interesting note for anyone familiar with the comics that they put him in there. There was also an alternate opening with Bruce trying to commit suicide but fails because he Hulks out. They cut that because they thought it'd be to extreme for kids but I thought that I'd mention it for anyone interested in stuff that was almost in there. Thank goodness that the Avengers comes in to try and fix this while also incorporating it in to the greater hole but first I move on to Iron Man 2.